I am so excited!!! Margie Deeb has included my Dark Carnival Cuff in her new PDF download!!! Her new booklet is entitled "Instant Holiday Glam" and is chock full of lovely beadwork and delicious palettes to inspire you. Please come and check it out!! You can order your own copy here. Believe me, it's worth it!!! Margie has been soooo nice to me, and if you aren't familiar with her, I encourage you to meet her on her website (www.margiedeeb.com) or her Facebook profile. 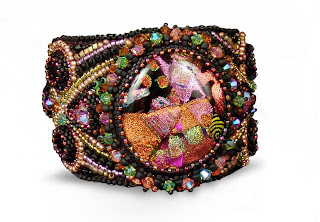 Also, Lynn Berry, the winner of my giveaway, has contacted me and let me know that she is thrilled to have won, and that she would like her cuff to be in purples, which thrills me, as I love to work with that color. This afternoon I will be off to the bead store, to buy some supplies to make sure it turns out lovely for her!! 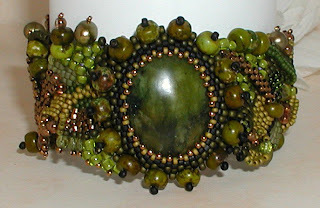 Have a wonderful weekend, and bead on!! We have a winner in my blog giveaway!!!!!!!!! I went ahead and did it normally this time, and used the "True Random Number Generator" on my Google search - and the number that showed up was number 42!!! The winning follower is LYNN BERRY!!!! 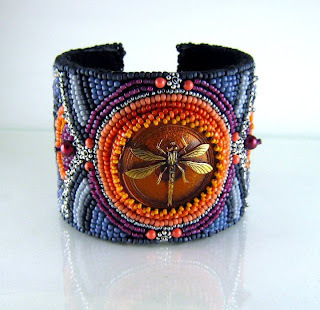 Who also happens to be a friend of mine on FB, so I am pretty excited to be making a cuff for her!!! (I'll let you know her response and her color choices in a little bit...) THANK you to everyone who followed me, and stay tuned, this is NOT going to be the only giveaway, I promise!! I am SO late!! I should have posted this last night or this morning - to my team mates, sorry!! The Handmade Division Team Blog topic this month is Inspiration, and where we find it. This is a huge subject!!! In reading over some of the other lovely blogs, and in the past years' reading of blogs, I notice that soooooo many people say they are inspired by nature...so my answer is boring - nature!! In my case, it is almost always plant life rather than animal, but to be specific - TREES inspire me!! Can you tell?? There are wayyyyyyyy too many pieces from each lovely lady to post them all, but take my word for it that they are all amazing. To check out more of the goodness click on their names, and you will get whisked away to their shops and/or Facebook pages. There is so much inspiration in the world that the easier question for me to answer would be; what DOESN'T inspire you!! Since I am sooo late getting this written, however, that's as much as I have time to squeeze in. Just so's you know, if you aren't with me on FB, I also have had the glorious luck to have a gallery (The Sharon Art Gallery in NH) accept my work and feature me in October! Yay!!! I am thrilled!! And please check out the other team members' blogs!! !